Meigs senior Madison Hendricks (left) drives past Wayne senior Maddie Wilcox (23), during the second half of the Lady Marauders’ 57-51 loss on Saturday in Rocksprings, Ohio. ROCKSPRINGS, Ohio — It all came down to the final 3:30. 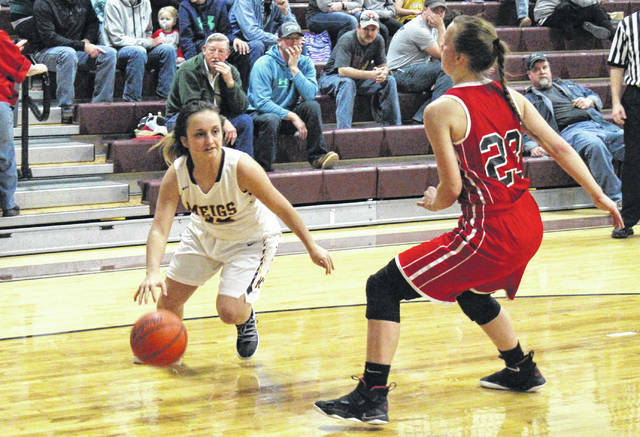 Meigs and Wayne were tied at 48 with 3:30 to play in Saturday’s non-conference girls basketball game inside Larry R. Morrison Gymnasium, and the Lady Pioneers ended the night with a 9-to-3 run and escaped Meigs County with a 57-51 victory. The Lady Marauders (7-7) led for just 23 seconds in the first half, at 3-2, as Wayne (12-1) scored the next 13 points and led by 12 with 4:23 to play in the opening period. 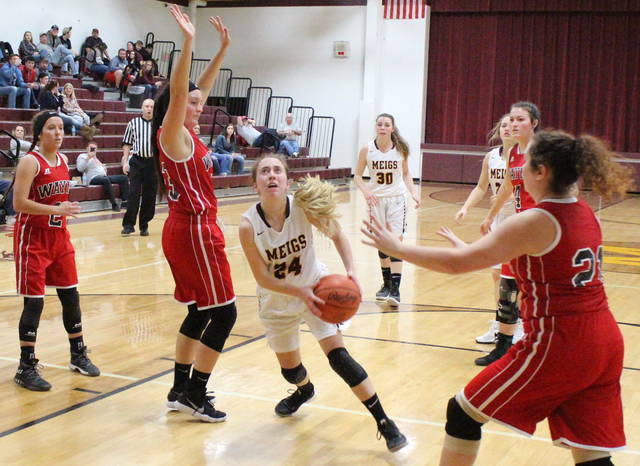 The guests managed just two more points in the first quarter, as Meigs roared back to within two points, at 17-15, by the end of the stanza. Wayne scored the first six points of the second quarter, but Meigs answered with a 7-0 run of its own, trimming the WHS lead to 23-22 with 3:50 left in the first half. However, the Lady Pioneers ended the half with a 6-1 run and a 29-23 lead. The Lady Marauders made it a one-possession game, at 35-32, five minutes into the second half, but Wayne stretched its lead to 43-34 by the end of the third quarter. 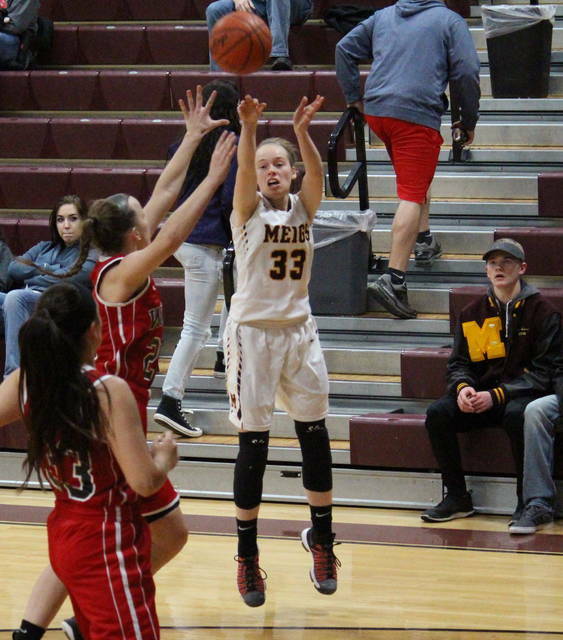 Meigs began chipping away at the WHS advantage in the fourth quarter, outscoring the guests by an 11-4 count over the first four minutes of the period. MHS junior Becca Pullins connected on a three-pointer with 3:49 to play, giving the hosts their first lead of the second half, at 48-47. However, the Lady Marauders were held scoreless for the next 3:44 seconds, in which time the Lady Pioneers regained the lead and extended it to nine points with a eight free throw and one field field goal. The Maroon and Gold hit a three-pointer with five seconds to play for the finale bucket of the Lady Pioneers’ 57-51 victory. “When you go 4-of-18 from three in the first half that’s a killer,” MHS head coach Jarrod Kasun said. “We had open looks, but we hadn’t been in the gym for a while and that really hurt us. It looked like our legs were a little short on some shots. We finally started hitting some shots in the second half and took the lead. They fought back, that’s what good teams do. When you get to the free throw line that many times you’re supposed to win, that’s just the way the game goes. For the game, Meigs shot 17-of-58 (29.3 percent) from the field, including 10-of-39 (25.6 percent) from beyond the arc. Meanwhile, Wayne was 17-of-54 (31.5 percent) from the field, including 1-of-9 (11.1 percent) from three-point range. From the free throw line, MHS shot 7-of-12 (58.3 percent), while WHS was 22-of-43 (51.2 percent). The Lady Pioneers claimed a 45-to-35 rebounding advantage, including 16-to-10 on the offensive end. Both teams had 10 assists in the contest. The hosts claimed a 4-to-3 edge in blocked shots, while the guests held an 8-to-6 advantage in steals. Meigs turned the ball over 15 times in the game, while Wayne gave the ball away 11 times. 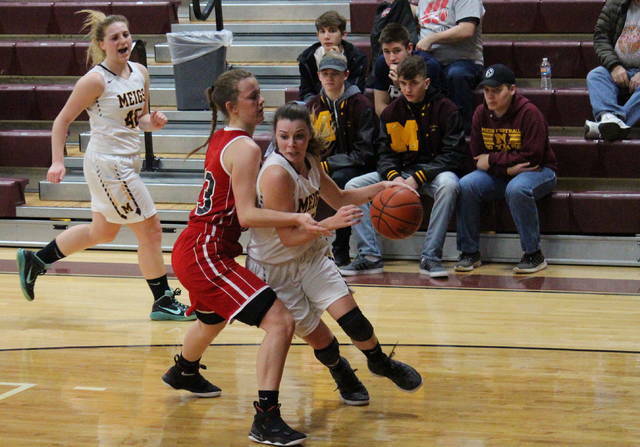 Marissa Noble and Devin Humphreys led Meigs with a dozen points apiece, with Noble hitting four three-pointers and Humphreys draining two long balls. Pullins scored nine points on a trio of three-pointers, Madison Fields added eight points, while Kassidy Betzing scored seven points and dished out a game-best six assists. Madison Hendricks rounded out the MHS scoring with three points on a trifecta. Humphreys recorded a team-best 12 rebounds, while Noble grabbed seven boards. Betzing led the Lady Marauder defense with two steals and two blocks, followed by Noble with one steal and two blocks. Aerial Adkins led the guests with 26 points, to go with 11 rebounds and four assists. Maddie Wilcox recorded 10 points and a game-high 18 boards, while leading the WHS defense with two steals and one block. Sara Hooks scored nine points for Wayne, Lakyn Adkins added six, while Whitney Sansom came in with three. Haley Wallace contributed two points to the winning cause, while Nakayla Elliott chipped in with one. Meigs will resume Tri-Valley Conference Ohio Division play on Monday against Athens and then will visit River Valley on Thursday.